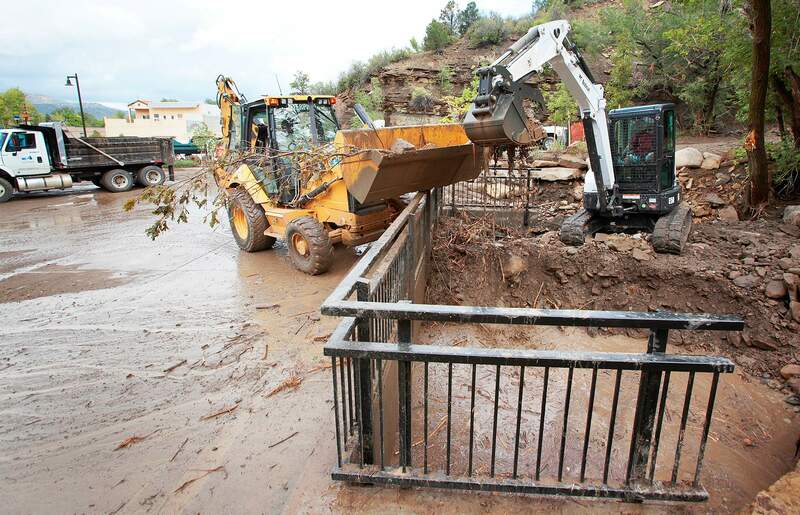 City of Durango crews use a front-end loader and Bobcat to clear a drainage in the parking lot of the Horse Gulch trailhead after September rain brought debris down Horse Gulch, clogging the drainage, causing it to overflow into the parking lot of the Horse Gulch Health campus. The new parking lot was not damaged, but the trail system needs maintenance. The city is particularly concerned about a short section of the old road that leads to Meadow Loop because it is not accessible to emergency vehicles. The city and county are currently negotiating an agreement to work together on it, hopefully this fall, said Kevin Hall, assistant director of community development with the city. In the last few weeks, Trails 2000, a club that maintains unpaved city trails, has been working on the Horse Gulch system and the old road that was blocked by boulders. “Trails 2000 has been really banging it out for the last few weeks,” Hall told the Natural Lands Preservation Advisory Board on Monday night. But Durango Police Department would prefer the road be rehabilitated because it provides the most direct access to help people on the trail system. Alternatives exist, but they do not allow for the same quick response time. Hikers and cyclists hurt themselves in Horse Gulch and need assistance almost monthly, Hall said. It is likely that the county would provide the manpower to fix the road, and the city would provide the materials. Lawyers are also working on an agreement in which the county might transfer management of the road to the city, but nothing is definite, Hall said. The repair work this fall likely would be an interim fix, until a more long-term solution to ensure access could be designed. The board debated the possibility of smoothing out the road with a finely compacted rock and making it more kid-friendly. But board members questioned the sustainability of such improvements. “If you just bring a road base, you’re going to lose it,” said Mark Smith, chairman of the board. The Natural Lands Preservation and the Parks and Recreation advisory boards plan to review the whole trail system Oct. 21. Many of the trails are converted roads that are being washed away, and the boards may consider some realignments.